As a child I went to the movies nearly every week. Sometimes I even went twice. I adored cinema and I loved to lose myself in a story, only to come out as the end credits are shown. I always wanted to do something with film. I specifically loved the actors. As an actor you can play a part and be someone you are not, maybe even someone you wouldn’t like in real life and that’s what was so appealing to me. I played theatre as a child and organised “murder nights” on the job, but it was only at the age of 29 that I took my first steps on stage. Man, I loved the feeling! Eventually I became the President of that same Association of Amateur Dramatics and now I’m acting and directing in three to four Theatre Associations. I also write for a magazine about Amateur Dramatics. It was only when we worked with film in a theatre production, that I learned about Associations for Amateur Filmmakers. I got to know some Amateur Filmmakers and played parts in some of their movies. I played the lead in De Touwtjesdans, together with my then 9-year-old son. 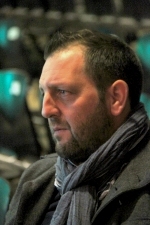 The film, made by Ronny Claus, ended second in the Flemish National Film Festival. Bit by bit I started thinking about making my own movie. I wrote a script, assembled cast and crew and finished Smiley in 2008, a thriller about a serial killer. We were very proud of this one, but it wasn’t good enough to really mean something. However, it was a good learning experience. In 2009 we finished Opposites Attract, a romantic comedy. This one scored a lot better, but we still had lots to learn. One of the problems was the acting. Both movies had a big cast and that meant it was almost impossible that all the actors were equally talented. In 2010 then we finished Waarom?, a love story. One location, four actors and Sonic Fire Pro. This was also the first time I spent a lot of attention to colour. The whole movie is bathed in a grey atmosphere. Until today this is the movie that I’m most proud of, although the audience doesn’t always understand what it’s about. (Watch Waarom? here.) That same year we also made Psycho Vriendin, with which we made it to UNICA for the first time. Onderweg en Psycho Vriendin 2 followed the next year. The first one did very well. In 2013 we finished De Loods. The idea for the story came a few years before we actually started filming. I saw Rundskop (Bullhead) and Mud and wanted to make a coming of age film, a story about young children growing up a lot faster than they wanted to. I also wanted to include something of Stand by me. Then I came up with the revenge-aspect and the theme of paedophelia. The latter came only later. In the beginning I never had the intention to make a movie about this. I was pretty sure about how I wanted the movie to end. I really didn’t want to give too much detail. I specifically wanted an open ending and from the beginning it was clear to me that I wouldn’t give away the ending too soon. Therefore we chose to work with two timelines, with flashbacks. A very important aspect of the film was the location. Although it was right under our nose, it took us a long time to find the ideal location. Only then we realised that it was just around the corner. The old electricity mill in our hometown was perfect. As I already said, actors are very important to me. They have to be able to perform almost without acting. As I am very active in the world of Amateur Dramatics, I know a lot of actors. However, actors who are good on stage are not necessarily good on film. Therefore I mostly work with actors I know very well. In this case we also needed child actors. The girl was played by my stepdaughter and the two boys we recruited through a friend who teaches drama to children. In order to get the actors to act as naturally as possible, we chose to shoot all scenes in five consecutive days and in chronological order so far as possible. That way everybody stayed in the film during the entire shooting period. It was hard, because most shooting days lasted until 3 o’clock in the morning. In order to make clear to the audience that there are two timelines, I wanted to use a different colour scheme, so lighting would be very important too. We spent lots of time lighting some scenes because I wanted it to be perfect. To give you an example: it took us more than four hours to set up the lighting for the opening shot. The same with some of the scenes inside. The idea to ‘cut out’ the actors from the background by the use of light. That was necessary because we couldn’t show much of the background without losing the right atmosphere. Of course we used colour grading, but most of the work was done on the set. For the music we used Sonic Fire Pro once again. This great program has lots of possibilities and in most cases you can find the right music for almost every atmosphere you want to create. The quote at the end caused some discussion. Not everyone of the crew wanted me to use it, but eventually I insisted. There’s a lot of truth in it and it goes further than this movie. Here it means that if you give a bad person power, he’s surely gonna use it for evil purposes. But it goes further than that. If you give anyone enough power, in the end they will certainly misuse it. We put a lot of work in this movie and everything turned out for the best. There was a good ambiance on the set, the editing went smoothly and the reactions of the audience were great. It sounds like a perfect scenario and maybe that’s just what it is. If every piece of the puzzle fits, then the result must be very good.